Risk management today is transforming as a critical business function, underpinning the operational, financial, and strategic health of an insurance company. The modern risk management arena is harnessing the potential of data technology and the transparency it provides to monitor, detect, and predict changes in life circumstances that will likely impact the insurance coverage needs. Big Data has evolved as a pivotal aspect in risk management, enabling carriers to analyze risk characteristics and claims statistics to decide the accounts that would benefit from additional loss control services. Meanwhile, analytics is increasingly leveraged to provide guidance for improving risk quality assessment and optimizing prices. In addition, due to the low cost of sensor, improved communication methods, and increased data processing power, insurers are increasingly adopting IoT for customer risk identification strategies. As a well-functioning and formal risk architecture assists insurance providers reduce and mitigate risk across the policies, and spot opportunities to improve performance. Risk management programs are becoming a key player in the insurance sector today. 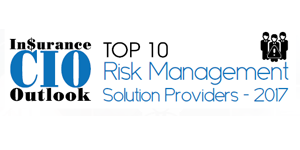 With numerous solution providers in the risk management arena for the insurance sector, it has become a difficult task for the CIOs to choose the best vendor offering comprehensive risk management solutions. 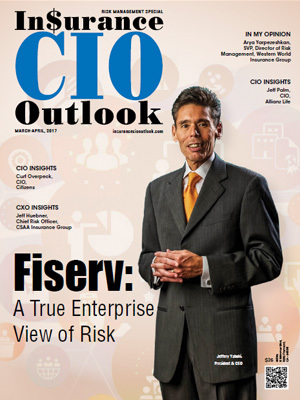 To help CIOs and CFOs find the right risk management solution provider for their insurance holding, a team of prominent CEOs, CIOs, VCS, and analysts along with the Insurance CIO Outlook editorial board has evaluated the best players in the risk management arena. The companies featured here demonstrate an ability to develop and provide innovative technologies, leveraging analytics, mobile applications, and cloud computing. The listing provides a look into how the modern risk management solutions work in the real world so that organizations can gain a comprehensive understanding of what technologies are available and how they shape up against the competition.